The Republican Debate was all bare knuckles, no pulled punches, but Trump hit Jeb Bush in the jaw. Jeb said, “stop attacking my family.” The audience was stuffed with Bush supporters as the video portrays. The pundits say Trump had a bad night, but listen to the content rather than the one liners. But according to recent polls Trump is front by a large margin. Cruz and Rubio went at like cats spitting in each others face. The people in America know that Donald Trump means business; he is the only Republican who can win the Presidency by pulling Democrat voters to vote for him. 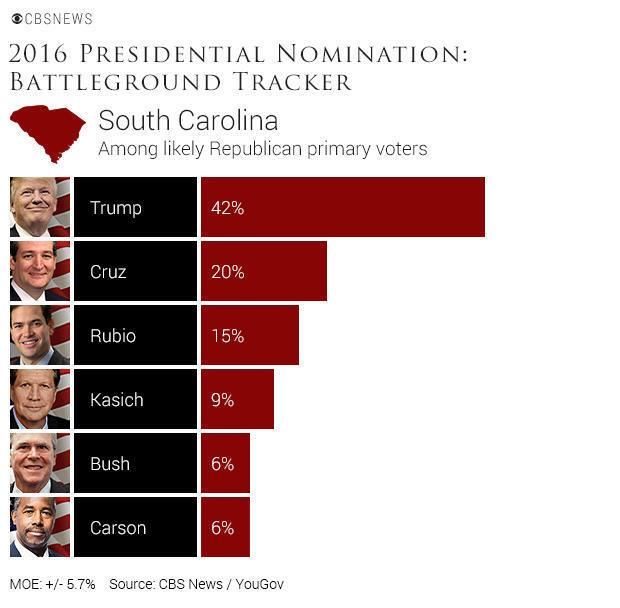 The CBS News Battleground Tracker poll shows that Donald Trump keeps a large lead in South Carolina, bolstered by support from conservatives and also from evangelical voters, who make up a large share of the electorate here. Ted Cruz is in second place, but well behind Trump. Cruz has the support of those who consider themselves very conservative, but trails Trump among all conservatives as well as moderates. John Kasich has gotten a little bounce out of his surprisingly strong showing in New Hampshire, but he may be limited here by the fact that evangelical voters are not as strongly in support of him as non-evangelicals. For Trump voters, who have been relatively steadfast in their support over the last few months, the percentage who say they’ve firmly decided on Trump has increased. Trump’s lead among evangelicals is up from January, and he has widened his lead among conservatives, too. In a contest marked by divisions among so-called “insiders” and “outsiders,” South Carolina Republicans show a strong preference for campaigns running as the latter, and this poll helps illustrate why. By four to one, South Carolina Republicans describe the “establishment” as a bad thing, and few describe it as a group that knows how to get things done. On the metric of being “prepared” to be president, Trump and Cruz do well, and Jeb Bush and John Kasich do relatively well, but Marco Rubio trails in this regard, suggesting that last week’s debate in New Hampshire may have had an impact. 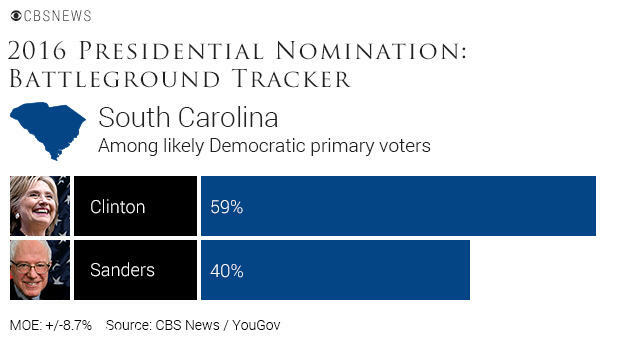 Hillary Clinton keeps her large lead in South Carolina, which has narrowed only slightly from last month, and she is bolstered by strong support from the African American voters who comprise most of the Democratic electorate here. Hillary thinks she is doing good; well folks for a 100% shoe-in six moths ago with 59% support that is not doing good, it is pathetic. We knew it, now confirmed, audience stacking. GREENVILLE, South Carolina — The chairman of the local Republican Party here confirmed to local television that 2016 frontrunner billionaire Donald Trump’s concerns—and those of his closest competitor Sen. Ted Cruz (R-TX)—with the Republican National Committee (RNC) allocation of debate audience tickets are well-placed. Trump came out of his corner swinging, round house rights, pounding away at his challengers. But Trump needs to tell America why the other candidates are ganging up on him. Why else, he threatens their lively hood. Most of the candidates know absolutely nothing about the private sector, the one that “The Donald” knows full well. Most of the candidates have never created a job, Trump has created thousands of jobs. Donald has to call out the lifer, the parasite, the political leach. He threatens them more that any other. He is the king cobra, they are his prey. Once Trump is elected these RINOs will face the music back home and it ain’t gonna be pretty. Click here for the latest on government corruption. 75% believe government corruption is wide spread. So far Trump has hit hard, shooting swift upper cuts into the opponent’s chin. They are badly bruised, most will hit the canvas TKO style, The end result will be another Donald victory; count on it. The candidate perhaps most eager to knock the billionaire businessman down a peg was former Florida Gov. Jeb Bush, who lost his lead to Trump over the summer. Repeatedly, Bush challenged Trump on his record and past comments. He told Trump to apologize to his wife for suggesting her being from Mexico makes Bush more sympathetic to Mexicans – Trump refused. He accused Trump of trying to, unsuccessfully, seek casino gambling in Florida. Trump later blamed Bush’s brother, George W. Bush, for President Obama’s election. “It was such a disaster those last few months that Abraham Lincoln couldn’t have been elected,” Trump said.